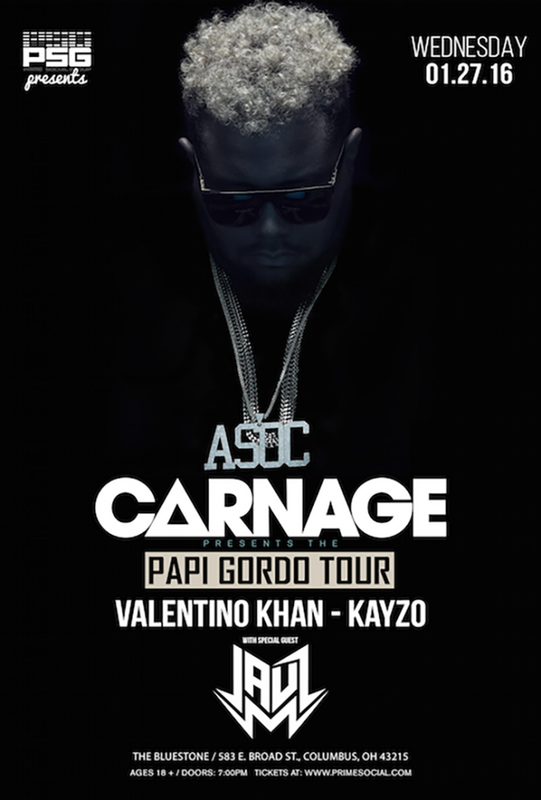 Papi Gordo also known as DJ Carnage invaded Columbus, Ohio this past Wednesday. Prime Social hosted the four DJ extravaganza that left the city in pieces. Walking into the Bluestone felt unreal. It was the night that the Papi Gordo tour would take over the city of Columbus. To be honest, this was the night that so many of us EDM lovers were looking forward to; even the newbies who had no idea was they were in for. With Kayzo, Valentino Khan, and Jauz opening for Carnage, it was expected to be an amazing night. However; it totally exceeded anyone’s expectation. While waiting in line ten minutes before doors were supposed to open at 7pm for Kayzo’s set, my friends and I found ourselves talking to people who had traveled from all over the state of Ohio to see this show. Upon entering the Bluestone, we didn’t know what to expect but we’re sure knew we were about to have the time of our lives. Kayzo started the night off with his iconic hardstyle sound, dropping some of his most famous remixes like his harder mix of Calvin Harris’ song, “How Deep is Your Love” and his harder edit of Skrillex’s “Red Lips.” To be honest, I was going crazy during this set and I kept asking myself: how the hell am I going to get through the next THREE sets? Kayzo transitioned smoothly to let Valentino take over for his set. It’s been known that Valentino loves Columbus and he made is clear; his set was UNBELIEVABLE. The party didn’t stop where he undoubtedly played his summer hit “Deep Down Low” which got the crowd super hyped up for the next supporting act, Jauz. Jauz kept the crowd moving by dropping some of his more well-known songs like his remix of Plur Police and Get On Up. While it was said that he had been putting a lot of hardstyle into his sets in previous tour stops, his set in Columbus was bass heavy with a lot of dubstep and heavy beats. When it came time for Carnage to make his appearance, he opened with streamers, fog machines and a really intense intro. We all knew right then and there that this was going to be a set to remember. The tempo was constantly fast paced and he left the crowd beyond satisfied. It felt like the set was never going to end but there were no complaints. Throughout Carnage’s set, the three openers made an appearance at a time which hyped up the crowd. One of the highlights of the night was when Valentino Khan joined Carnage on stage and successfully attempted a stage dive. Valentino was carried to each corner of the crowd which kept the mood fun and lighthearted. Overall, this show was a huge success and I know that Columbus will welcome all four artists, especially Carnage, with open arms. Considering this stop was only two weeks into the tour, be sure to catch Carnage when he comes to your town! Can’t wait to see more from him and all the supporting artists.